To Cite: Fraioli M F, Giovinazzo G, Emmanuele Umana G, Fraioli B, Lunardi P. Petro-Clival Tumours: Role and Indications of Transoral and Transsphenoidal Approaches Followed by Hypofractionated Stereotactic Radiotherapy, J Minim Invasive Surg Sci. 2016 ; 5(1):e34431. doi: 10.17795/minsurgery-34431. Background: Petro-clival, clival and spheno-petro-clival tumours are still a neurosurgical challenge. Usually, the classical skull base transpetrous approaches are employed, although they are burdened by an important rate of morbidity, and a very low rate of radical removal is reported. Objectives: We present our indications and results with minimally invasive transnasal and transoral approaches. Patients and Methods: We present 14 patients affected by petro-clival, clival and spheno-petro-clival meningiomas/chordomas with prevalent extension ventrally to the brainstem; cranial nerves V to XII and vertebra-basilar arterial complex resulted posterior and laterally displaced. Preoperative clinical symptoms were represented by aspecific headache in 6 patients, mild and moderate contralateral hemiparesis in 3 and 2 patients respectively, mild and moderate tetraparesis in 2 and 1 patients respectively and cranial nerves deficit in 11 ones. Preoperative planning considered three objectives: to avoid operative and post-operative mortality/morbidity, to achieve satisfactory tumour removal and to avoid tumour regrowth. Anterior approach (transoral in 6 and transsphenoidal in 8 other) was selected for these patients according to postero-lateral approaches complexity due to the anterior-medial position of the tumour in respect of cranial nerves and vascular arteries. Results: In no patient radical removal was performed because gross total/subtotal removal had been programmed preoperatively on the basis of tumours extension. Concerning the 4 clival chordomas, gross total in two patients and subtotal removal in the two other ones was performed. Gross total removal was accomplished in the clival meningioma, while subtotal removal was achieved in 5 petro-clival and in 2 spheno-petro-clival meningiomas; partial removal was performed in one spheno-petro-clival and one petro-clival meningioma. No mortality and no neurologic deficits were registered after surgery. Preoperative neurologic deficit improved in the majority of patients. Conclusions: Anterior transoral and transsphenoidal approaches are indicated for clival and spheno-petro-clival region tumours located ventrally to the brainstem and medially to acoustic meatus, to perform a prevalently median tumour debulking; these approaches allowed an extremely low rate of new neurological deficit and a rapid resumption of vital activities, obviously in relation with preoperative clinical status in our patients. Petro-clival, clival and spheno-petro-clival tumors are still a neurosurgical challenge (1-3). Usually, the classical skull base transpetrous approaches (middle fossa anterior petrosal, posterior petrosal, combined petrosal approaches and complete petrosectomy) (1, 4-6) are employed although they are burdened by an important rate of morbidity and a very low rate of radical removal is reported (3, 7-14). Because tumour growth is slow and neurovascular structures present a various degree of adjustment, diagnosis is usually performed when tumour is large, and this fact implies the need to perform surgery as first therapeutic step; the problem is that if surgical removal is too extended, rate of postoperative deficit is too high, and on the contrary if surgical removal is too little, control of postoperative tumor remnant is problematic also with radiotherapy. So that, a difficult equilibrium between tumor removal and postoperative quality of life and multidisciplinary therapy is needed to achieve the best results in patients affected by these tumours. Surgery and in particular neurosurgery, in the modern era, should be aimed to offer a good postoperative quality of life and tumour control, rather than aiming at total or gross total removal at all costs burdened by important neurological deficit. According to this concept, we present, in selected cases, our experience with anterior transoral and transsphenoidal approaches followed by hypofractionated stereotactic radiotherapy in selected patients affected by clival, petroclival and spheno-petro-clival tumours. Only tumours located prevalently ventrally to the brainstem were included in the study. That is tumours arising from the clival/petro-clival dura materbone and located anteriorly-medially to the cranial nerves V to XII and to the vertebra-basilar arterial complex. We present 14 consecutive patients, 9 women and 5 men, with average age of 70.2 years (ranging from 46 to 76, twelve patents older than 67 years), operated from 2005 - 2012. All patients underwent preoperative GD-enhanced MRI with angio-MR and motor/sensitive evoked potentials. Tumours were represented by four clival chordomas, one clival meningioma, six petro-clival and three spheno-petro-clival meningiomas; size of tumours was 3 to 5.5 cm in 10 patients and 5.5 to 7 cm of maximum diameter in the last 4 patients. Brainstem posterior or posterolateral displacement was present in 11 cases, vertebra-basilar complex displacement and encasement in seven, ponto-cerebellar angle cranial nerves encasement in 11 ones; vertebra-basilar complex displacement without encasement was evident in 3 patients and intracavernous carotid artery and cranial nerves were encased in 7 patients (Figure 1). Figure 1. A, T2 weighted axial MRI showing a clival chordoma; evidence of prevalent median extension (black arrows) in respect of cranial nerves, with posterior displacement of vertebra-basilar complex (white arrows); B, Post-contrast T1 weighted axial MRI showing a petro-clival meningioma with involvement of cavernous sinus (white arrow). Preoperative clinical symptoms were represented by aspecific headache in 6 patients, mild and moderate contralateral hemiparesis in 3 and 2 patients respectively, mild and moderate tetraparesis in 2 and 1 patients respectively and cranial nerve deficit in 11 ones (Table 1). All patients presented relevant tetra-hyperreflexia. Mild hemi- and tetra-paresis were considered when the patient presented conserved autonomy for simple life activities and only mild limitations for complex (e.g. driving, sport) and working ones. Moderate hemi- and tetra-paresis were considered when the patients resulted autonomous for simple life activities but were not able to perform complex and working activities. Concerning cranial nerves impairment, trigeminal nerve was impaired in two patients who presented monolateral facial paresthesias and dysesthesia; sixth cns paresis was evident in another who presented diplopia; two other patients presented hemifacial paresis and acouphenes due to 7th and 8th cns impairment; dysphagia, weak and/or hoarse voice were present in 10 patients, due to 9th, 10th and 11th cns impairment; finally, twelfth cn deficit was observed in one patient. Out of the 10 patients affected by lower cn impairment, one had been affected by recurrent misdiagnosed aspiration pneumonia during the previous year. The first (MF Fraioli) and the senior (B. Fraioli) authors performed 5 and 9 operations respectively from 2005 to 2012. Three objectives in treatment of these difficult tumours include: to avoid operative and post-operative mortality/morbidity, to achieve satisfactory tumour removal and to avoid tumour regrowth. Therefore, gross total/subtotal removal through anterior approach followed by hypofractionated stereotactic radiotherapy was planned, expecting to remove median and para-median portion of the tumours, leaving in situ lateral tumor remnants because lateral bleeding and adjacent neurovascular structures were not controllable by this approach. Tumor removal was considered “gross total” when postoperative MRI showed only hyperintensity of the dural/bone implant; “subtotal” removal was intended when tumor remnant was within 2.5 cm of maximum diameter, and “partial” removal when it was more than 2.5 cm. Anterior approach was planned for all these patients because in all cases the tumours were located anteriorly to acoustic meatus, anteriorly to cranial nerves entry zone and anteriorly-medially to the vertebra-basilar complex. Adequate informed consent was administered to all patients, explaining the objective and the aim of the proposed treatment, and explaining the participation to the study. Three meningiomas (two petro-clival and one spheno-petro-clival) and 3 chordomas were treated by transoral approach, because their major extension corresponded to the inferior third of clival bone. The approach was performed opening the soft palate with lateral displacement of the uvula, opening the pharynx and by drilling the anterior arc (tuberculum) of the atlas and the dens of C2; finally, removal of transverse ligament was performed to expose the dura mater. Therefore, after opening the dura mater, a direct access to the tumour was achieved without any necessity of nervous/vascular structures manipulation. Chordomas were removed by aspiration with standard aspirator, while for meningiomas ultrasonic aspirator was necessary to remove the typical fibrous tissue; microsurgical instruments dedicated to transoral surgery (microforceps, microdissectors), were also necessary for tumor removal. Endoscopic control was performed in all patients to visualize the lateral portion of the operative field. 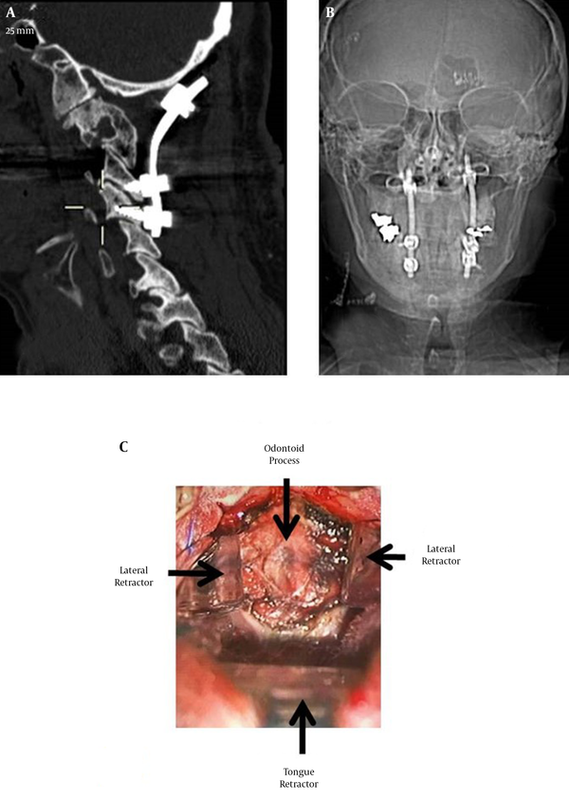 No postoperative instability was observed in 5 patients, based on postoperative dynamic cervical X-ray and the absence of any symptom referred by the patients, as nucal pain; one patient reported nucal pain 4 months after surgery, but cervical X-ray didn’t enlighten signs of instability; however, posterior occipito-cervical stabilization was performed (Figure 2) because previous transoral approach comported removal also of C1 ring and we preferred not to run the risks of acute cranial settling (15). Meticulous closure of mucosal planes was performed to avoid postoperative cerebrospinal fluid leak. Figure 2. A, Sagittal CT scan showing occipito-cervical stabilization performed after transoral approach; B, Antero-posterior X-ray scan shoving stabilization; C, Operative view, at operative microscope, of transoral approach with exposition of odontoid process after removal of anterior ring of atlas. The 8 other patients (one clival meningioma, four petro-clival meningiomas, two spheno-petro-clival meningiomas, one clival chordoma) were treated by extended transsphenoidal approach, because the tumours were prevalently located in the upper third of clivus. It was used a microsurgical endoscope assisted approach, through an anatomic submucosal dissection in a single nostril, opening the sphenoid sinus, exposing the anterior wall of clivus in meningiomas, and exposing directly the tumoral tissue replacing clival bone; sella turcica was never opened because it was anterior and superior with respect to the tumour position and extension. Meticulous reconstruction of cranial base defect (16) was performed in particular for meningiomas, to avoid postoperative cerebrospinal fluid leak. All patients performed precocious MRI after surgery, and after 1 - 2 months they were submitted to hypofractionated stereotactic radiotherapy. Radiotherapic centering was performed by 1 - 5 tesla MR and spiral CT; fusion of images was then elaborated and contouring of target and organs at risk was performed on the fused images. Immobilization system was achieved by thermoplastic mask with bite; stereotactic coordinates were identified thanks to relocatable stereotactic frame. A total dose of 3900 cGy was delivered to the target through 10 biweekly fractions of 390 cGy (Figure 3). Figure 3. 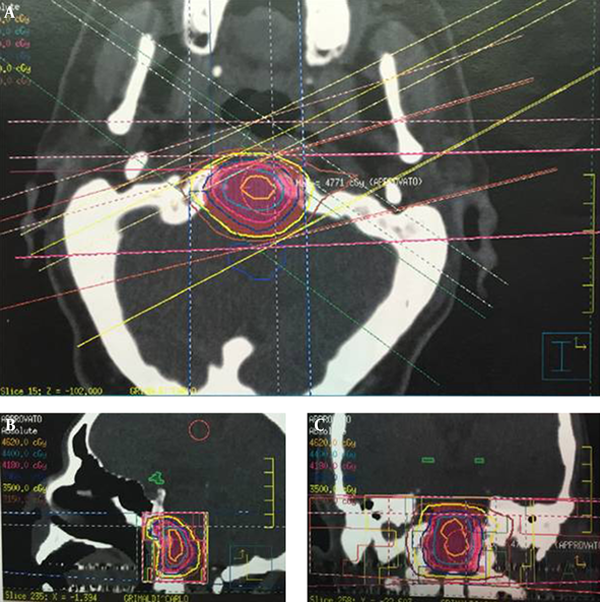 Radiotherapic planning and target contouring in axial, sagittal and coronal slices in a case of chordoma treated by transoral approach. The isodose lines of treatment are evident. In no patient radical removal was performed because gross total/subtotal removal had been programmed preoperatively on the basis of tumours extension. Concerning the 4 clival chordomas, gross total in two patients and subtotal removal in two other ones was performed (Figure 4 A-B). Gross total removal was accomplished in the clival meningioma, while subtotal removal was achieved in 5 petro-clival and in 2 spheno-petro-clival meningiomas; partial removal was performed in one spheno-petro-clival and one petro-clival meningioma (Figure 4 C-D). Figure 4. 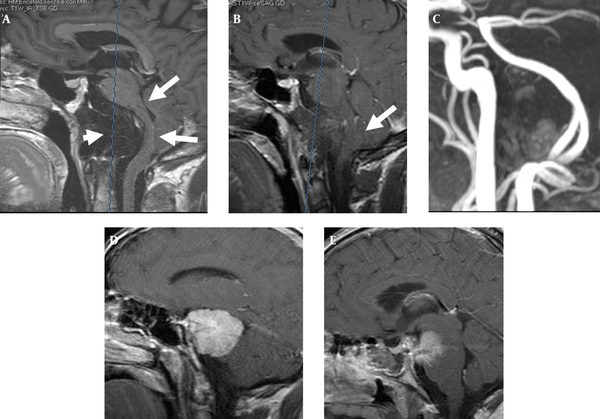 A, Preoperative post-contrast T1 weighted sagittal MRI of a clival chordoma (arrow head); posterior displacement of brainstem is evident (white arrows); B, Postoperative post-contrast T1 weighted sagittal MRI after transoral approach, showing a satisfactory tumor removal with brainstem decompression (white arrow); C, Preoperative angio-MRI of the same patient, showing posterior displacement of vertebra-basilar complex; D, Preoperative post-contrast T1 weighted sagittal MRI of a petroclival meningioma; E, Postoperative post-contrast T1 weighted sagittal MRI showing tumour removal after transsphenoidal approach. No mortality and no neurologic deficits were registered after surgery, apart a transitory slight hypoglossal paresis in one patient affected by spheno-petro-clival meningioma operated by transoral approach. Preoperative neurologic deficit improved in the majority of patients (Table 2); in summary, motor deficit improved in all patients, and all but one recovered a satisfactory ability for simple, complex and working life activities. Concerning preoperative cranial nerve impairment, a certain degree of glossopharyngeal deficit remained in three patients who were however able to feed themselves without naso-gastric tube or other devices; vagus deficit didn’t regress in two patients who continued to suffer from weak or hoarse voice; accessory nerve deficit remained unchanged in one patient who continued to suffer from sternocleidomastoid and trapezius muscles weakness; in one patient facial paresthesias and dysesthesia remained unchanged due to trigeminal nerve deficit; finally, acouphenes and tinnitus remained in one patient. Cranial nerves deficit in the other patients recovered during an average period of 19 months; after 26 months no further improvement was registered in any patient. In no patient new neurologic deficit appeared after stereotactic radiotherapy and the improvement of preoperative neurologic deficit continued also during the radiotherapic treatment itself. aNo postoperative neurological deficits occurred. During an average period of 5 - 4 years, two clival chordomas (treated respectively with gross total and subtotal removal) presented initial recurrence that was treated by stereotactic radiotherapy in one patient and by proton beam in the other; clival meningioma didn’t recur. Out of the five petro-clival meningiomas treated by subtotal removal followed by HSRT, no patient presented regrowth and in two cases a progressive tumour shrinkage was observed; concerning the 2 spheno-petro-clival meningiomas treated by subtotal removal, no regrowth was observed. Regrowth occurred in the spheno-petro-clival meningioma treated by partial removal and petrosal approach was performed because tumor regrowth regarded mainly the lateral portion of the tumour beyond vertebra-basilar complex; after surgery, a new hypofractionated stereotactic radiotherapy was performed. Neurosurgeons know that, in the modern era, surgery is focused mainly to improve preoperative neurological functions than to perform radical removal at all costs; consequently, especially thanks to adjuvant therapies (stereotactic radiotherapy in particular), invasive and too risky operations are less justified than the past decades especially in patients more than 65 years of age as those of our series. In our opinion, it is important to select the most appropriate surgical approach according to tumour location and extension to achieve a satisfactory tumour removal in absence of postoperative mortality or neurological deficit. While the classic middle fossa anterior petrosal, posterior petrosal combined petrosal approaches and complete petrosectomy remain indicated for the great majority of spheno-petro-clival tumours, transoral and transsphenoidal-transnasal operations are suitable approaches in patients affected by prevalently median clival, petro-clival and spheno-petro-clival tumours located anteriorly than acoustic meatus and ventrally to brainstem. In these tumours, brainstem is posteriorly displaced and vascular vertebra-basilar complex is often encased and posteriorly and laterally displaced. In general, for similar tumours approached by classic retrosigmoid and the various petrosal approaches, low rate of gross total removal has been reported (45% Roberti et al. 2001 - 40% Little et al. 2005 - 20% Park et al. 2006 - 32% Natarajan et al. 2007 - 28% Nanda et al. 2011) with important rate of cranial nerve deficits (47% Roberti et al. 2001 - 23% Little et al. 2005 - 28,6% Park et al. 2006 - 20,3% Natarajan et al. 2007 - 32% Nanda et al. 2011). Other Authors reported a major rate of gross total removal (78% Spetzler et al. 1992 - 79% Bricolo et al. 1992 - 69% Couldwell et al. 1996), but significant cranial nerve deficits (39% Spetzler et al. 1992 - 76% Bricolo et al. 1992 - 33% Couldwell et al. 1996) and not ineligible rate of mortality (9% Bricolo et al 1992 - 3.7% Couldwell et al. 1996). Transoral and transnasal approaches allowed a direct access to the tumours without necessity of vascular and nervous structures manipulation, and allowed to perform tumor debulking with direct access and action on the dural and bone implantation of the lesions, reducing afferent vascularization from the cranial base to the tumor itself in our experience. Ultrasonic aspirator was necessary to remove the tumour without executing any traction on the tumour itself; tractions are very dangerous especially when tumours encase the vertebra-basilar complex and when it is adherent to brainstem because arterial injuries or brainstem damaging can occur. The choice between transoral or transnasal approach was done according to cranio-caudal tumor extension: when the tumour was limited to the upper third of clivus, transnasal approach was selected but when inferior third of clivus or craniospinal junction were interested by the tumour, transoral approach was employed; some Authors described (17) endoscopic extended endonasal approach also for craniospinal junction tumours, but they reported, however, a less surgical exposition than transoral approach for this region. Moreover, other authors (18) reported utility of extended endoscopic endonasal approach, but in particular for extradural tumours. Finally, postoperative hypofractionated stereotactic radiotherapy is preferable than radiosurgery in our opinion because the first one is more conservative for neurovascular structures and allows to treat relatively larger tumour remnants compared to radiosurgery which is usually more indicated for smaller targets (19). Other postoperative adjuvant therapies, such as proton beam therapy is considered when modern radiotherapies have failed in controlling tumour grow. Postoperative follow-up is performed by clinical and radiologic controls. It is clear that evidence of a quite large tumor remnant at postoperative MRI is not satisfactory for the neurosurgeon, but in this tumors it is necessary, in our opinion, to shift the attention on the clinical follow-up by monitoring the tumor remnant by seriated MRIs. A good postoperative outcome in absence of neurological deficit, although the presence of tumor remnant, is an acceptable result because postoperative radiotherapy usually allows satisfactory tumour control (13, 19, 20) and patient can have a normal social life for many years. Moreover, also in case of petrosal approaches, we suggest a conservative tumor removal in order to spare neurologic functions. For younger patients, although tumor growth is usually slow for meningiomas and chordomas, it can be occured that tumor remnant regrows: in this case, a second operation can be performed, selecting the most appropriate approach according to the direction of extension of the tumour. Some Authors, in fact, propose in selected cases staged surgery or combined surgery (17). Concerning the possible postoperative instability after odointectomy and clival removal (after transoral approach), we agree with other Authors that sparing integrity of lateral masses of atlas and C1 ring minimizes risks of instability (15, 21); therefore, in our patients we didn’t perform immediate posterior occipito-cervical fusion, but we submitted patients to dynamic cervical X-ray 1 week, six months, one year and two years after surgery. One patient who had been submitted to odointectomy and removal also of C1 ring, reported postoperative nucal pain and although dynamic X-ray didn’t show instability, posterior occipito-cervical fusion was performed. In conclusion, anterior transoral and transsphenoidal approaches are indicated for clival and spheno-petro-clival region tumours located ventrally to the brainstem and medially to acoustic meatus, to perform a prevalently median tumour debulking; these approaches present in our experience an extremely low rate of new neurological deficit and a rapid resumption of vital activities, obviously in relation with preoperative clinical status. We believe that in the modern skull base era, in particular in patients over 65 years, it’s mandatory to deal with these extremely challenging tumors with a different goal: to achieve the maximal clinical result and the maximal tumour growth control, and not the maximal surgical resection at all costs. “When to take great risks; when to withdraw in the face of unexpected difficulties; whether to force an attempted enucleation of a pathologically favourable tumor to its completion with the prospect of an operative fatality, or to abandon the procedure short of completeness with the certainty that after months or years even greater risks may have to be faced at a subsequent session all these take surgical judgement which is a matter of long experience” Harvey Cushing (22). Authors’ Contribution: Each Author had relevant role in the manuscript.